The distance between Ergneti and Tskhinvali is just two kilometres, with only the river Liakhvi to separate them. But despite the 2008 war having ended some of the population still cannot return to their homes. They cannot return not only because houses have been burnt and destroyed but also due to the unstable living and working situation there. According to the Tirdznisi village council's attorney, Temur Tetunashvili, today only 70% of the permanent residents of Ergneti have returned to their homes. Part of the village – land plots and fifteen houses - is now on so-called South Ossetian territory and the village is surrounded on one side by Georgian and the other by Russian and Ossetian flags. Giorgi Kasradze 22, is an Ergneti resident. His house, like many others, was destroyed in the war and today he lives in a one-room cottage built by the Norwegian Refugee Council with his mother and sisters. Before the war Giorgi had a car maintenance business in the village and never complained of a lack of customers, but then everything was lost and now everything has to be built again. Many people like Giorgi are now trying to reestablish themselves. Once the village was noisy and crowded, now it is nearly empty - you rarely see people walking in the streets. It seems really hard to restart you life in a little cottage next to your burnt-out house. “There are thousands of people who still have their homes but have lost agricultural machinery, cattle or poultry, their main sources of income. All services and small or medium-sized businesses, so necessary for the village population, have also been destroyed,” says Temur Tetunashvili. Today these people are trying to regain their farms or businesses but most have neither the technical means nor finance to do so. That’s why Giorgi and thousands of people with the same problems are now looking hopefully at international organisations. This is why the project “Enhancing Rural Livelihoods in the Adjacent Area”, funded by the United Nations High Commission for Refugees (UNHCR), has been launched. 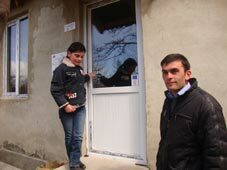 The project is being implemented by CARE International in the Caucasus in 20 Shida Kartli villages and aims to disburse small grants for the people wishing to start a small business. “There is no car maintenance service in our village, so Ergneti residents, like those of neighbouring villages, often have to go to Gori for this service. If my proposal is funded I will regain my old customers, find new ones and have a source of income,” says Giorgi. He hopes to return to his trade and, together with his father, restart the business. Competition is very high though. The project will fund 30 entrepreneurs and provide machinery to 10 farming collectives, but there have been over 300 applications. The applications are very diverse – some want to run a little shop, some to open a bakery, some would like to return to their trade and others want to run beauty parlours or suchlike to serve the villagers. There are also agricultural ideas – cattle breeding, rabbit farms, bee-keeping and so on. All these businesses would be really necessary for the village. The new business owners will benefit from the income they derive and in many cases new jobs will be created. Enhancing Rural Livelihoods in the Adjacent Area Project Manager Giorgi Badrishvili says that the main criteria for evaluating the applications are how much income they will generate and how many new jobs they will create. Women and youth involvement will be highly appraised. From the 373 proposals 60 have been selected in the first phase. Their authors will be trained in small business management by partner organisation CTC. After the training the applicants will write business plans and the winners will be identified on this basis. The winning proposals will have to directly benefit at least 30 people and their families. The village population as a whole will also have to benefit from different services provided within the village, which will save them time and money and ultimately improve their livelihoods.